Balsamic vinegar is associated with only two potential health problems. It could erode dental enamel due to its acidity, and it may contain some lead. While the amount of lead is considered to be too small to affect adults, there's a chance it might raise lead levels in children. If you have any concerns about lead, talk to your health care provider to be sure you're safe. Traditional balsamic vinegar is produced in only two regions in Northern Italy. Locally grown white grapes are cooked and fermented naturally for several weeks. After that, bacteria is introduced to promote more fermentation, then the vinegar is put into wooden barrels and aged for at least 12 years. All true balsamic vinegars carry a D.O.P stamp, which certifies the vinegar's quality and origin. They also contain just one ingredient: grapes. 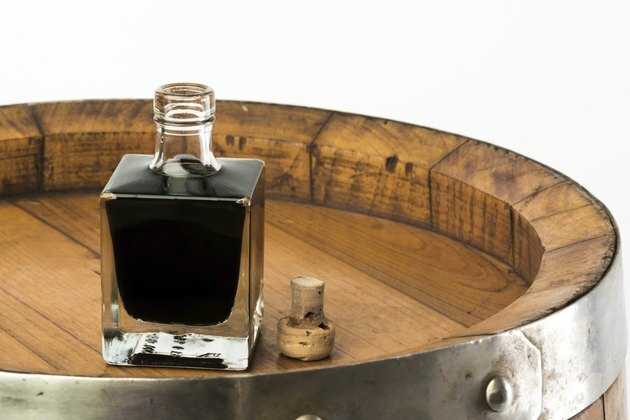 The long aging process means traditional balsamic vinegars carry a big price tag. As a result, different variations are produced. The least-expensive options are imitations made from wine vinegar or cider vinegar with sweeteners and coloring added so that they emulate the flavor of traditional balsamic vinegar. Balsamic vinegar is a little less acidic than other vinegars, but it still has the potential to erode tooth enamel. Any food or beverage that has a pH of 4 or lower can wear away tooth enamel, and balsamic vinegar's pH is right around 4. Acid is a bigger problem if you use traditional balsamic vinegar because it's usually drizzled directly onto foods. Less-expensive brands are mixed with oils for salad dressing or added to foods, so the acid impact is reduced. You can minimize damage from acid by drinking water to rinse your mouth and waiting an hour before brushing your teeth, recommends the Minnesota Dental Association. Two-thirds of all the vinegars tested in California contained more lead than allowed under state regulations. When 58 balsamic vinegars were tested again several years later, researchers confirmed that the aged varieties had nearly three times more lead than less-expensive varieties, according to a report published in "The Science of the Total Environment" in June 2011. The highest amounts of lead found are still considered trace amounts. Adults would have to consume 1 cup to 2 cups of balsamic vinegar daily to get enough lead to cause concern, notes Timothy Harlan, M.D., also known as Dr. Gourmet. However, if children consumed 1 tablespoon daily of a vinegar with the most lead, their blood levels would increase by 30 percent, which is above the amount normally found in children living in lead-free environments, reported "Environmental Health News" in 2009. Vinegar is so low in calories that excessive intake isn't much of a risk, but it's still good to know that balsamic vinegar contains more calories than other types of vinegar. If you love using it you could consume enough calories to exceed your daily goals. Most types of vinegar, such as red wine and cider, have only 3 calories per tablespoon. By comparison, 1 tablespoon of balsamic vinegar has 14 calories. The difference is due to the 3 grams of carbohydrates found in balsamic vinegar. Dr. Gourmet: Does Balsamic Vinegar Contain Lead?